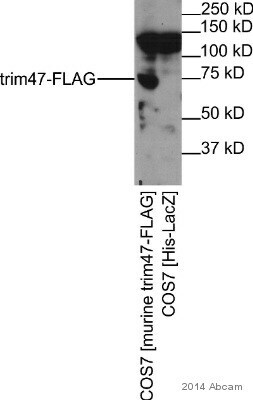 Recombinant fragment corresponding to a region within amino acids 356-638 of Human TRIM47 (Uniprot ID: Q96LD4). A549 and HeLa whole cell lysate (ab150035); HeLa cells; colon cancer tisue. Our Abpromise guarantee covers the use of ab155549 in the following tested applications. Immunofluorescence analysis of paraformaldehyde-fixed HeLa cells labeling TRIM47 with ab155549 at 1/500 dilution (Green). Alpha-tubulin filaments were labeled with an alpha-tubulin monoclonal antibody at 1/2000 dilution (Red). Immunohistochemical analysis of paraffin-embedded colon cancer tissue labeling TRIM47 with ab155549 at 1/250 dilution. ab155549 has not yet been referenced specifically in any publications. Publishing research using ab155549? Please let us know so that we can cite the reference in this datasheet.